Nissen Blind Rivets 2 items. 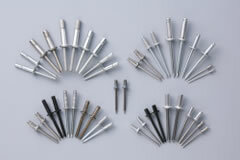 Blind rivets are utilized in every industry and at every site. They make possible one-step fastening of multiple base materials from one side, thus contributing a great deal to rationalization such as operator’s labor-saving, cost reduction and speed-up. NISSEN offers full-size lineup of standard items circulating in the market; at the same time, we manufacture special order products with specifications adjusted to various applications as required by the customers. Besides, for the first time in Japan, we used light-weight and high corrosion-resistant titanium alloys, in addition to the conventional materials such as aluminum, iron, stainless steel and copper. As the pioneers in production of blind rivets, we will stay on the leading edge of the ‘connection’ technologies.